In recent years, there has been a renewed focus on STEM education in the United States, fueled by evidence that young learners’ competencies in science, technology, engineering, and mathematics are falling behind those of their global peers. Scholars and practitioners are beginning to utilize the new pedagogical opportunities offered by mobile learning to improve the successes of teachers and K-12 students across STEM subjects. 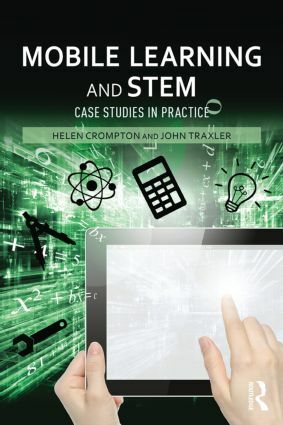 Mobile Learning and STEM: Case Studies in Practice is a comprehensive collection of case studies that explore mobile learning’s support of STEM subjects and that utilize mobile technology to facilitate unique and effective K-12 teaching and learning experiences. In addition to its focus on STEM achievement for researchers, this volume is a resource for teachers working to implement mobile learning initiatives into their classrooms. Mobile Learning and STEM also includes research that is applicable to classrooms in nations around the world, where few students from underrepresented racial and socioeconomic backgrounds are entering into STEM jobs. Concluding with a summary of its research and its implications to future scholarship and practice, this book is a springboard for practitioners, specialists, higher education instructors, and researchers who want to establish better practices in schools and raise student achievement in STEM subjects.